Parkinson’s disease (PD) is a neurodegenerative disorder that results in motor dysfunction. PD patients display primary motor symptoms such as: resting tremor, bradykinesia, rigidity, and postural instability. Cognitive dysfunction and dementia are common in later stages of the disease. While the etiology of PD is unknown, genetic mutations have been attributed to approximately 5% of cases. The pathology is characterized by changes in the basal ganglia dopamine (DA) system. Alpha-synuclein accumulations called Lewy bodies are observed in DA neurons of the substantia nigra. As the disease progresses, DA signaling is disrupted by a loss of neurons in the substantia nigra and their innervations to the striatum. Current treatments are limited and primarily focus on increasing/restoring DA signaling. Biomodels offers a mouse model of Parkinson’s disease using the neurotoxin 1-Methyl-4phenyl-1,2,3,6-tetrahydropyridine hydrochloride (MPTP). Following systemic administration, MPTP crosses the blood brain barrier where it is then metabolized into MPP+ in astrocyctes. MPP+ selectively targets dopamine neurons following uptake via the dopamine transporter. Once inside the neuron, MPP+ disrupts the electron transport chain within the mitochondria resulting in cell death and the accumulation of free radicals. Biomodels has validated the MPTP model of Parkinson’s disease in mice using both behavioral and histological endpoints. 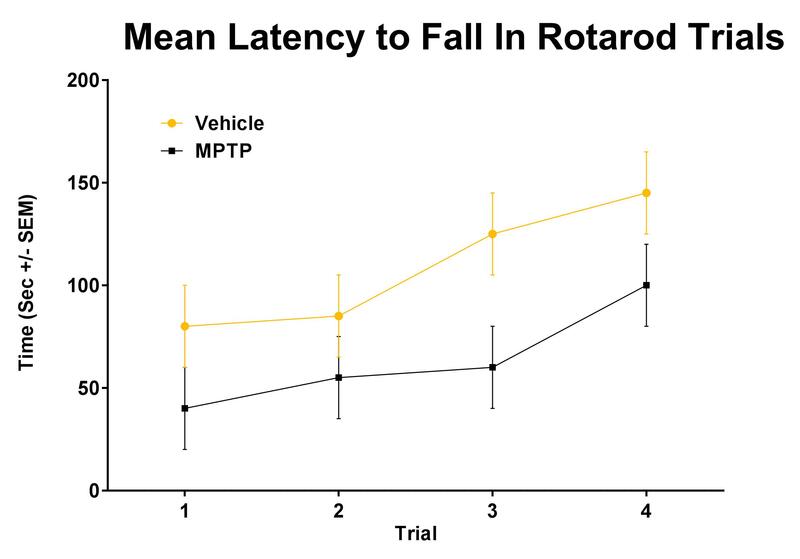 To evaluate motor dysfunction, mice are tested using the rotarod. Mice treated with MPTP display reduced latencies to fall from the rod. This dysfunction is related to the loss of dopamine neurons in the substantia nigra as evidenced by a reduction in tyrosine hydroxylase staining. Unilateral neurotoxin-induced nigrostriatal damage, resulting in impaired DA neurotransmission, can be induced with the use of 6-hydroxydopamine (6-OHDA). In this model, 6-OHDA injected unilaterally into the striatum causes ipsilateral decreases in DA synthesis and release, resulting in characteristic turning behavior. The turning behavior can be measured to provide a quantitative measure of injury. Treatment compounds can be administered and their effects on rotational performed can be evaluated. Additional behavioral endpoints can be paired with this model (such as rotarod) as well as histological examination.